PATCO’s uniformed Transit Ambassadors provide a presence in the stations, parking lots, concourses, and on the trains primarily in the evening hours. They are equipped to assist customers with information, ticket/gate issues or simply alert appropriate personnel if any other situation should arise. They are equipped with information on schedules, fares, rules and area attractions. You can ask them about anything. They are an extra pair of eyes and ears at PATCO. If you see something that doesn’t look quite right, don’t hesitate to approach them. They are also equipped with radios so that they can quickly alert appropriate personnel of any situation that may arise. 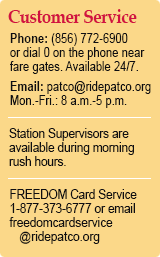 We believe their presence will help create an even friendlier environment for PATCO customers.